We wandered around town for a bit last Sunday, at a loose end, floating from record shop to record shop with nothing much to do. Eventually, we got hungry, and stood outside Jumbo Records, uncertain what to do. Leeds is blessed with a superb restaurant scene. There are dozens and dozens of first-rate places to go, but sometimes choosing one feels like those times you’re sat in front of the TV, trying to choose a film to watch from the thousands available, paralysed by the choice. I made a snap decision, to break the deadlock, because asking a teenage boy to make a decision is never really going to end well, is it? Fuji Hiro. Just around the corner, (shockingly) never been there, noodles, done. The place was empty. A small dining room, with plain formica tables and little decoration. A serviceable, functional canteen with no frills and no fuss. A man sat at the table in the corner prepping veg with a short, sharp knife, a box of vegetables in front of him and a bowl to his side nodded at us in greeting. We were told to sit anywhere. Anywhere would do. It didn’t matter. We ordered a beef noodle dish and a yaki udon. It was only just after midday, and we were the only people there. We heard the kitchen roar into life as our order went in, the burners flaring up with a whoosh, the clatter of woks on iron pan stands, and the shrill hiss of meat, vegetables and noodles hitting hot oil. Minutes later, for anything cooked in a wok is by its very definition fast food, we were eating, eating huge plates full of steaming noodles, rich and spicy, substantial and delicious. 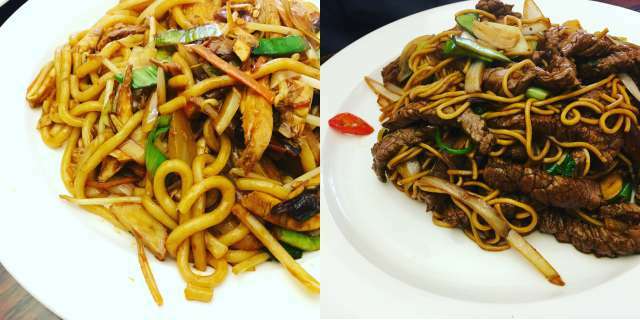 Beef, seared and scorched, laced into thin egg noodles slick with soy, thicker udon noodles and chicken and prawns, carrots sliced thin and fried quickly, the brush of chilli and mirin, sesame oil and dashi. It’s easy to miss Fuji Hiro. It isn’t much to look at, and its plainness is almost overwhelming, but it isn’t about the decor, it’s about the food, and oh my, what food. The best twenty quid I’ve spent for months.